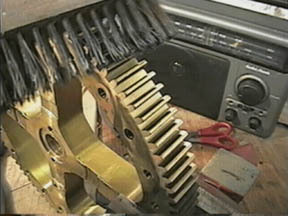 All parts were soaked in a 50/50 mixture of degreaser to remove any old lacquer, paint and dirt. 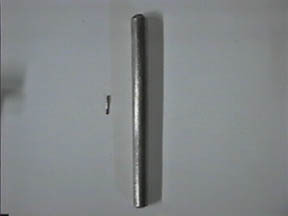 (Fig.1,13, 20). 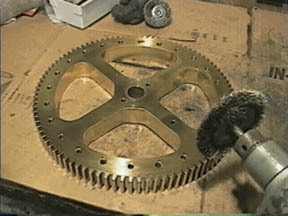 Be sure not to leave bright work (brass) in degreaser for extended period of time as it can cause discoloration. 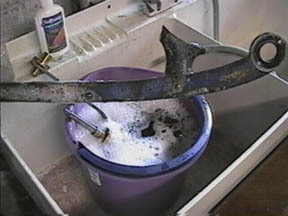 Brightwork can then be soaked in L&R or similar ammoniated cleaner to bring out a shiny look. Follow direction closely. 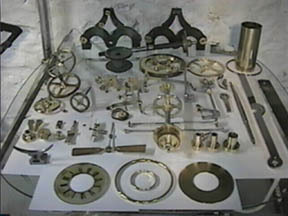 There is controversy in the use of ammoniated cleaners on brass, in that it is claimed that surface stress cracking can result. 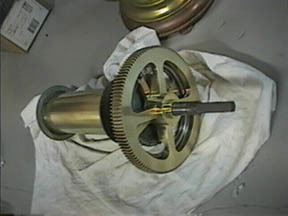 I think the risk of this is negligible on parts of such size as those found in tower clock movements. 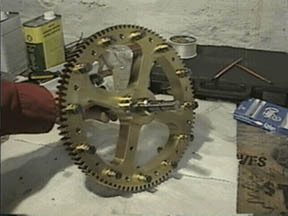 All wheel works as well as exposed shiny metal parts were given a satin finish as this was original. 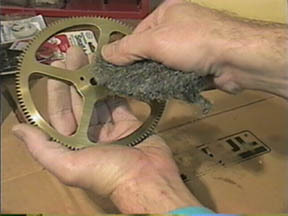 This was done with medium/fine grade steel wool for brass. 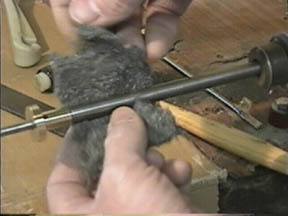 For steel arbors, flat arms and levers three grades of sandpaper and then two grades of steel wool were used. 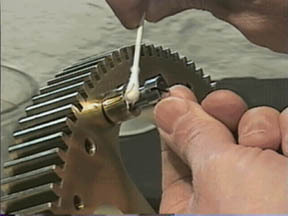 Small wheel and pinion teeth can be cleaned with a wire wheel. 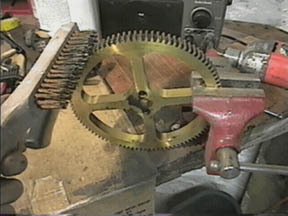 Larger teeth will not allow the wire wheel to penetrate their entire depth, so the tops are done with the wheel and the rest is done with a stiff wire brush and much hand effort. 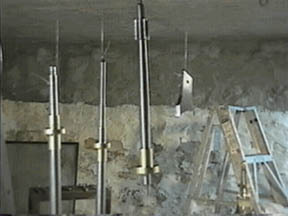 Arbors were put into a drill chuck and finished through three grades of wet/dry sandpaper and then three grades of steel wool (Fig. 6,22). 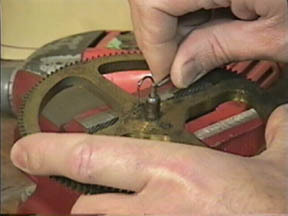 The pinwheel pins and areas between them were done with a small tool designed for such close work (Fig. 4,5). 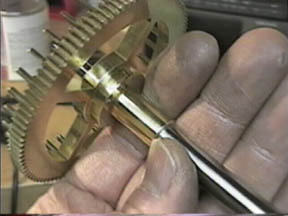 Filister head bolts were turned in a chuck for the sides, hand finished on the tops and a couple grades of sandpaper inserted into the slot head to clean. 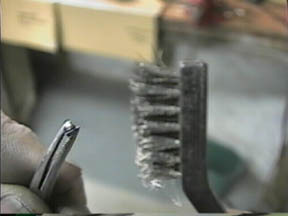 If the bolt was severely oxidized a fine file was used in place of sandpaper, before and after shots in Fig. 11. 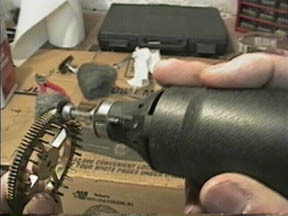 Before any disassembly takes place, all slot heads are cleaned out with a dental tool to be sure screw driver seats properly. 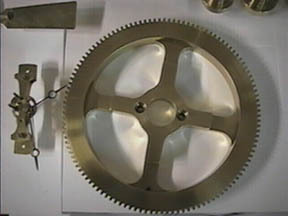 Fig 34 shows the main strike wheel-the largest wheel in the clock weighing in at 18 lbs. 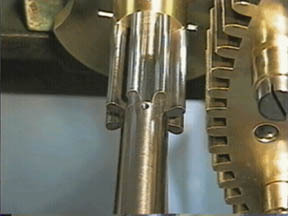 The curved lines seen between the holes where the bell hammer lifting bearings were located presented special problems. 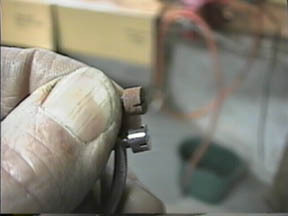 These marks were caused by the steel cams rubbing, but over the years the steel oxidation became embedded deeply into the metal giving a reddish appearance. 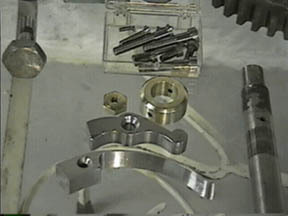 The most efficient way of getting at this would be to use a milling machine; taking a few microns off. 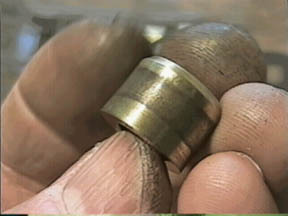 Lacking this, I continued hand work with a wire wheel and various abrasives to finally achieve the finish (Fig. 36). Fig. 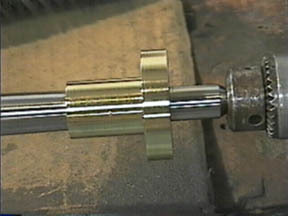 29 and 30 show a hammer pallet bearing and retaining bolt. 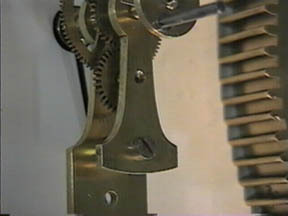 The first two out of twelve on each side of the wheel were numbered to show the position and direction that the rest of the un-numbered bolts should go. 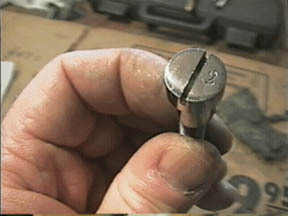 I always observe the rule to put all bolts and screws back exactly as found even if they appear identical. 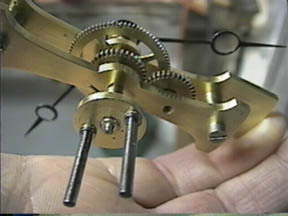 In the case of this clock nearly all bolts of identical shank diameter are not interchangeable as the thread pitch is slightly different on each! 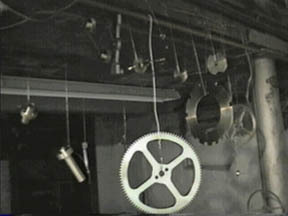 This means if the bolts on this wheel alone were mixed, save for the four identified with numbers, the remaining 20 are a guess. 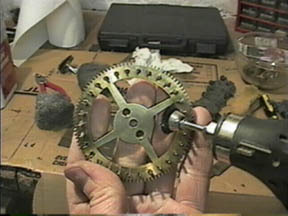 The thread pitch is so slight that many would go in most of the way while others would barely start. 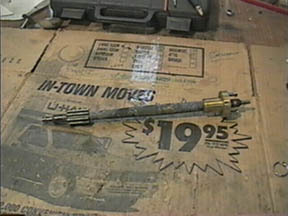 This was also the case for all wheel bearing and frame bolts, all of which, fortunately, were numbered. 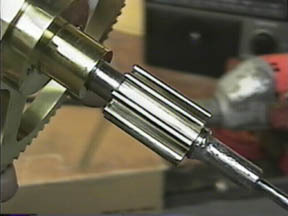 On each arbor two screws held the wheel to the collet. One had a dot mark while the other did not. None were interchangeable. 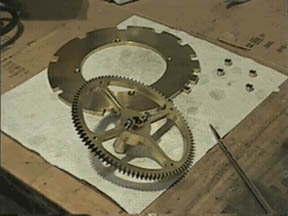 For a clock of later nineteenth century manufacture this is most curious. I can't help but suspect this was done purposefully since perfect interchangeability at that time was easily achieved. Fig. 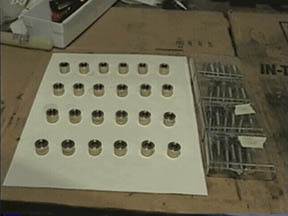 33 shows the bolts finished, kept snug and in order in marked boxes. 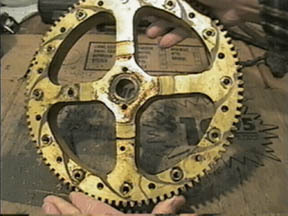 After the parts were cleaned and finished satisfactorily they were dipped in a tank containing a 50/50 thinned lacquer mixture to avoid drips and thickness runs. 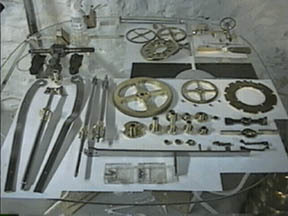 All parts were then hung up to dry like so much laundry, (Fig. 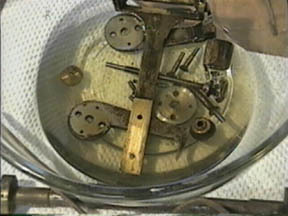 24,25). 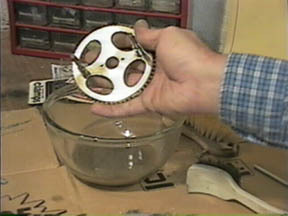 Lacquer is more environmentally hazardous to work than clear enamel but the finish is superior. 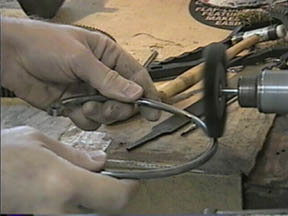 Lacquer is far more forgiving and tends to "tighten up" as it dries correcting for any possible slight drips or runs. 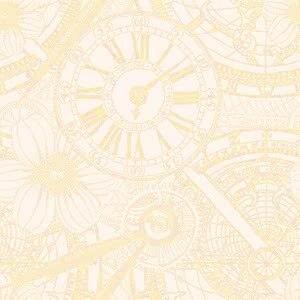 On my current project I am using an air gun with lacquer which is far easier and faster but care must be taken with fumes which are very poisonous and combustible. Fig. 15-17 show the scale of parts in this movement, in particular Fig. 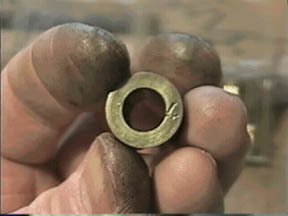 17 depicting the smallest/largest taper pins. 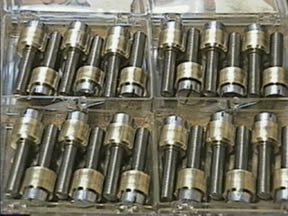 Figure 19 and 40 show all the parts of the going and strike train, less winding barrels, ready for reassembly. 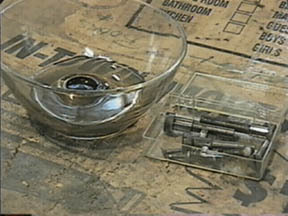 Total parts count was 453.